New York, NY (May 26, 2011) – Lisa Kudrow, star of the online web-series “Web Therapy,” has been tapped to host the 15th Annual Webby Awards, set to be held at The Hammerstein Ballroom on Monday, June 13, 2011. In addition to her traditional hosting duties, Kudrow will also be responsible for ensuring that winners stick to the Webby Awards’ famous five-word speech limit. Through an innovative partnership with Facebook, this year’s ceremony will be broadcast live on the Webby Awards official Facebook Page, as well as on participating partner pages including The Huffington Post, Martha Stewart, (RED), BuzzFeed, National Geographic and SportsNation. Lisa Kudrow won a Webby this year for “Best Individual Performance in an Online Video,” and Web Therapy picked up the award for “Best Comedy: Long Form” for the second straight year. Known for her portrayal of the iconic character Phoebe Buffay on “Friends”, and for films like “Romy and Michele’s High School Reunion” and the critically-acclaimed HBO series “The Comeback”, Kudrow is the creator and star of the Webby Award-winning series “Web Therapy.” That show was recently picked up by Showtime and will debut on the network in July. Groupon, the “deal-of-the-day” website – reportedly nearly sold earlier this year to Google for $6 billion – will be honored as the Webby Breakout of the Year. The company’s CEO, Andrew Mason, will be on hand to accept the honor. Red Burns, founder of New York University’s Interactive Telecommunications Program, will be presented with a Special Achievement Award recognizing her lifelong commitment to fostering many of the young minds who paved the way for today’s thriving media world. For information on this year’s Webby Award winners, visit www.webbyawards.com. 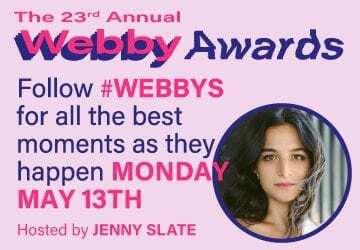 To apply for media credentials, please go to www.webbyawards.com/press/cred_req.php. You will be notified as to the status of your request by Friday, June 10. Hailed as the “Internet’s highest honor” by the New York Times, The Webby Awards is the leading international award honoring excellence on the Internet, including Websites, interactive advertising & media, online film & video, and mobile & apps. Established in 1996, the 15th Annual Webby Awards received nearly 10,000 entries from all 50 states and over 60 countries worldwide. The Webby Awards is presented by The International Academy of Digital Arts and Sciences. Sponsors and Partners of The Webby Awards include: AOL, Aquent, Yahoo!, Microsoft, Ford, Dentyne, Facebook, MLB Advanced Media, Rackspace Hosting, LBi, Buddy Media, YouTube, HP, USA Today, Business Insider, 2advanced.Net, PricewaterhouseCoopers, Time Out New York and Guardian News and Media.